I agree with your title; you found a REAL one. Congrats! I wouldn't have the slightest desire in the LI for even $25. Yes, I was really excited when I heard about the Limited Edition. Not that I had $199 laying around with nothing to do, but a red kettle sounded like it would be a really cool addition/replacement kettle. I tried REALLY HARD to be understanding and at first felt that some Weber fans were being unrealistic in their expectations. I also attributed some of the reports to bad shipping & handling. However, when I finally got to see some of them in person at the Home Depot south of me, I was extremely disappointed. The picture I posted pretty much tells it all. I hope that at least some buyers got ones free of glaring defects, but I really don't think any of them have the real red color like my classic one. So, yes I would rather have a 40-year old kettle with some chips - "patina" - from years of use but still with a beautiful sheen and the feel of quality that made Webers famous. Yep, give me a real one with some “velveteen rabbit syndrome” over the all new reddish orange peel finish in a heartbeat. A little dent, a chip make them “real”. WOW! That's hitting one out of the park! Way to go, Jose. Do you think you should feel just a little guilty? On the Weber Kettle Club site there is a guy who makes perfect replicas of the wood handles for these older Weber Kettles. You can get one with the Weber logo or with Weber...The One. The Only. Since you got such as awesome deal on your red kettle, maybe you will want to splurge on new handles ! One other thing. 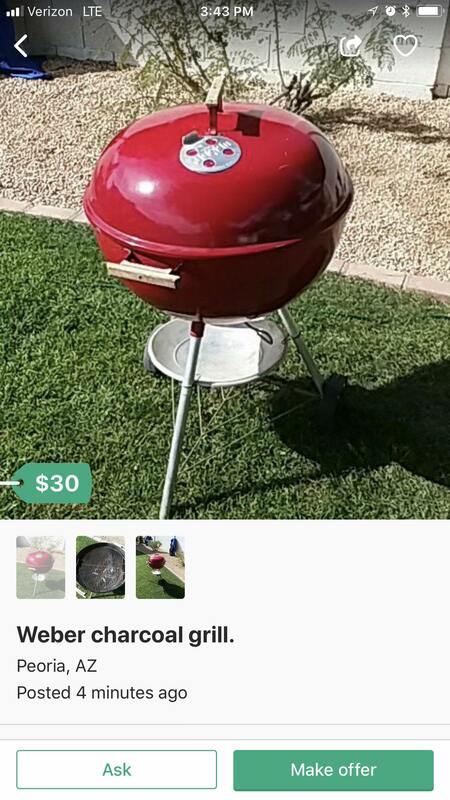 If you have interest in this, since your grill has the "one touch" sweep vents, if you can find another donor grill with the removable ash pan and the holder for it you can put that on your red kettle to make it easier to use. Mine is the really old kettle with the metal handles (that I love) but also the three separate vents on the bottom (which are not so fun to clean up after). Congrats on a GREAT FIND! Now have fun using it. I have to wait until tax season is over, but I am told that these red kettles "blush" when good and hot and turn a deep, dark red. Yes, yes they do blush! The yellow ones and brown ones do some cool color change dances too. No snow last night and the temperature is improving! Time to grill something!! I agree you should try to keep it in the family. The type you have with the darker edge is really cool. The guy from the WKC said it is “Coppermist” even though I have always thought that was a golden brown color. Collectors like them! The kettle people generally seem to feel that refurbishing a Kettle should be limited to cleaning and replacing parts. They have some great guides to restoring the various parts of the Kettle on the WKC site. I know you can’t paint porcelain, but I wouldn’t be above some rust remover and a careful spot spray of high heat red paint. I guess you have to weigh the pros and cons on a case by case basis. John, there was misunderstanding somewhere. That one is known as a red mist. The copper mist is indeed brownish in color with a black fade. That fade to black is what "mist" references. Darren, for the rust spots, you might opt for a rust converter instead of remover. VHT red caliper paint would be a close match. Another option is to just oil the spots up, heat the grill, rinse repeat. Kind of like seasoning a pan. That makes a lot more sense, and maybe that is what Charlie, the WKC member, was trying to tell me. I had just picked up a grill acting as an "agent" for yet another WKC member. I had thought Charlie referred to it as "coppermist". After I picked it up, I was driving with it in a van and called Charlie. I told him it was a red kettle with just a dark area around the lid. I was driving so maybe I didn't follow him completely. But, yes, red mist would be a perfect description for yours and the one that I picked up. Thanks for clarifying. I do plan to keep it. And, I have a rust converter like naval jelly that I intended to use on the rust. Originally Posted by Darren C.
I will be interested to hear how that works out. I am thinking about trying VHT rust converter and then doing a cover with VHT red paint - ONLY on the affected area. Then try to feather edges with a Dremel with a buffing attachment. I would never paint over porcelain, but if it is already gone, I don't see why touching up the raw metal would be a bad thing. I guess I will start small and see how it looks. I have to admit that many collectors seem to feel that it looks better un-retouched.